President Donald Trump says the new agreement is "a great deal for all three countries." OTTAWA — In the new dawn of North American free trade, the stock-taking of winners and losers has begun, but the catalyst of the marathon 14-month negotiation — U.S. President Donald Trump — is calling it a great deal for all three countries. It was a magnanimous early morning Twitter appearance from an American president who was blasting Canada just days ago and threatening crippling auto tariffs if it did not settle, and who used the social media platform to call Prime Minister Justin Trudeau "dishonest" and "weak" earlier this year. "Late last night, our deadline, we reached a wonderful new Trade Deal with Canada, to be added into the deal already reached with Mexico. The new name will be The United States Mexico Canada Agreement, or USMCA," Trump said in one of two Twitter messages. So, officially, the long-familiar NAFTA is now known as the U.S.-Mexico-Canada Trade Agreement. Trump said he had no intention of keeping the old name. The new agreement, he said, is "a great deal for all three countries" because it "solves the many deficiencies and mistakes in NAFTA, greatly opens markets to our Farmers and Manufacturers, reduces Trade Barriers to the U.S. and will bring all three Great Nations together in competition with the rest of the world. The USMCA is a historic transaction!" Canada, along with Mexico, took a "do no harm" approach to the talks, and there were early indications the Trudeau government succeeded in preserving the status quo in key areas, even though it faced criticism for giving the U.S. concessions on dairy. The deal preserved the key dispute-resolution provisions — Chapter 19 — which allow for independent panels to resolve disputes involving companies and governments, as well as Chapter 20, the government-to-government dispute-settlement mechanism. For Canada, this was a hill to die on — as it was for former prime minister Brian Mulroney during the original 1988 Canada-U.S. free trade deal — because, Trudeau argued, there needs to be some rules for settling disputes when dealing with the current U.S. president. Other contentious, so-called U.S. poison pills — which would have limited Canada and Mexico's ability to bid on lucrative U.S. procurement projects — are gone. The United States "finally came to their senses" and created an environment conducive to reaching an agreement with Canada, said Jerry Dias, head of the major Canadian union Unifor, a key player in the negotiation drama. "Things started to change when the United States understood that we weren't moving on the dispute mechanism, Canada's cultural exemption needed to be in place, we weren't going to bend on the auto industry," he said today on Parliament Hill. Canadian dairy farmers immediately panned the renegotiated deal, saying it will undercut the industry by limiting exports and opening up the market to more American products. Dairy Farmers of Canada issued a terse statement saying the deal would grant an expanded 3.6-per-cent market access to the domestic dairy market and eliminate competitive dairy classes, which the group says will shrink the Canadian industry. It said the measures will have "a dramatic impact not only for dairy farmers but for the whole sector." "This has happened, despite assurances that our government would not sign a bad deal for Canadians," Pierre Lampron, the organization's president, said in the statement. "We fail to see how this deal can be good for the 220,000 Canadian families that depend on dairy for their livelihood." Canada had previously offered the U.S. a 3.25-per-cent market share under the old Trans-Pacific Partnership agreement, which Trump also derided — and pulled the U.S. from — after he took office in 2017. Canada also agreed to get rid of its two-year-old Class 7 pricing agreement that has restricted U.S. exports of ultra-filtered milk used to make dairy products. Dairy Farmers objected to this, too, but the once-obscure dairy classification had become a lightning rod of discontent for Trump. Trump said it was unfair and economically crippling to dairy farmers. U.S. administration officials, speaking on the condition of anonymity, said Sunday night that this was a win for farmers in Wisconsin, New York and elsewhere. Trudeau would only say it was a "good day for Canada" as he left a late-night cabinet meeting in Ottawa that capped several days of frenetic long-distance talks. A side letter published along with the main text of the agreement exempts a percentage of eligible auto exports from tariffs. A similar agreement between Mexico and the U.S. preserves duty-free access to the U.S. market for vehicles that comply with the agreement's rules of origin. Canada fought hard to retain Chapter 19, a holdover from NAFTA that U.S. trade ambassador Robert Lighthizer worked tooth-and-nail to eliminate. 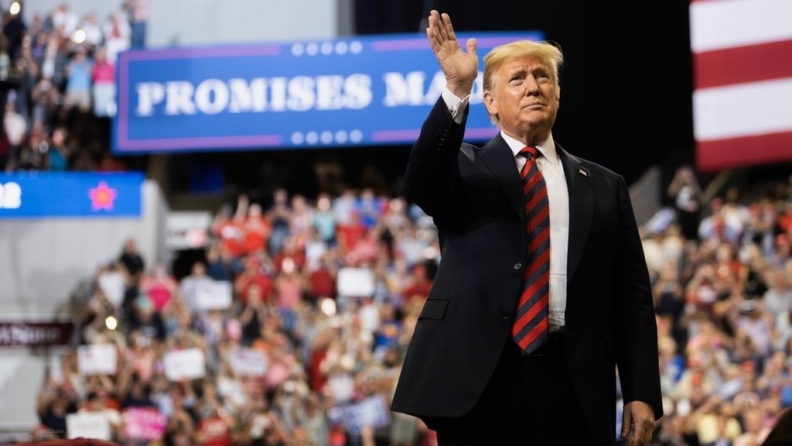 "USMCA will give our workers, farmers, ranchers, and businesses a high-standard trade agreement that will result in freer markets, fairer trade and robust economic growth in our region," Lighthizer and Chrystia Freeland, Canada's foreign minister, said in a joint statement. On the matter of Section 232 tariffs, Trump's trade weapon of choice, U.S. officials told a late-night conference call with reporters that the two sides had "reached an accommodation" on the issue.